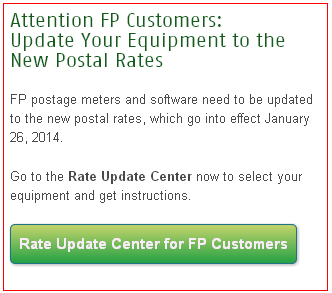 USPS® postal rates will increase on January 26, 2014, affecting most letter and parcel delivery services. The postal regulatory commission approved both the inflation-based (CPI – Consumer Price Index) and exigent (based on economic “emergency” conditions) increases. These increases impact “market dominant” services (i.e., first-class letters over which the USPS has a monopoly) and “competitive services (i.e., package delivery where the USPS competes on the open market). First-class stamped letters (1 oz.) increase three cents to 49 cents, with additional ounces increasing one cent to 21 cents. 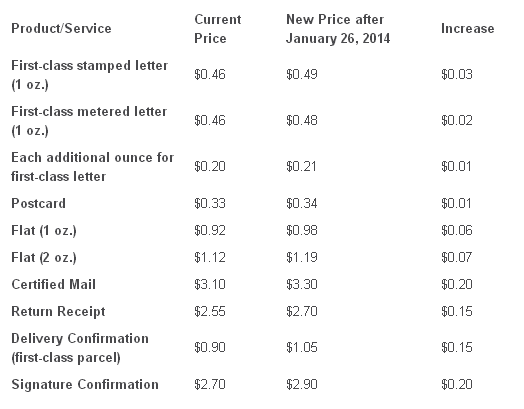 Postage-metered first-class letters are discounted one cent to $0.48. International stamped letters (1 oz.) increase to $1.15. Postcards increase one cent to 34 cents. Priority Mail remains the same rates for all current shipping zones. “Delivery Confirmation” service will now be called “USPS Tracking”. “Express Mail” service will now be called “Priority Mail Express”. 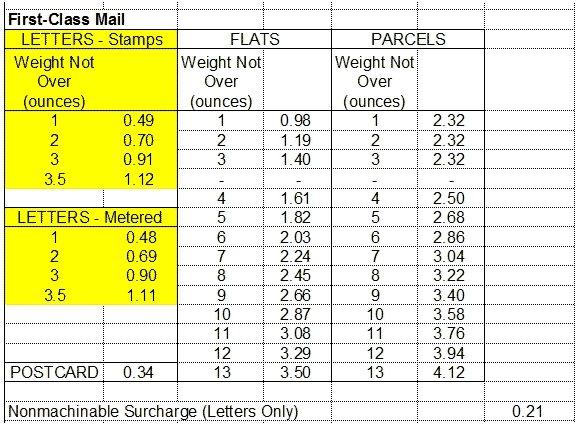 The screen shot below is from USPS Postal Explorer, January 2014 Price Change Information, Updated 01/03/14, showing new rates for standard first-class letters.